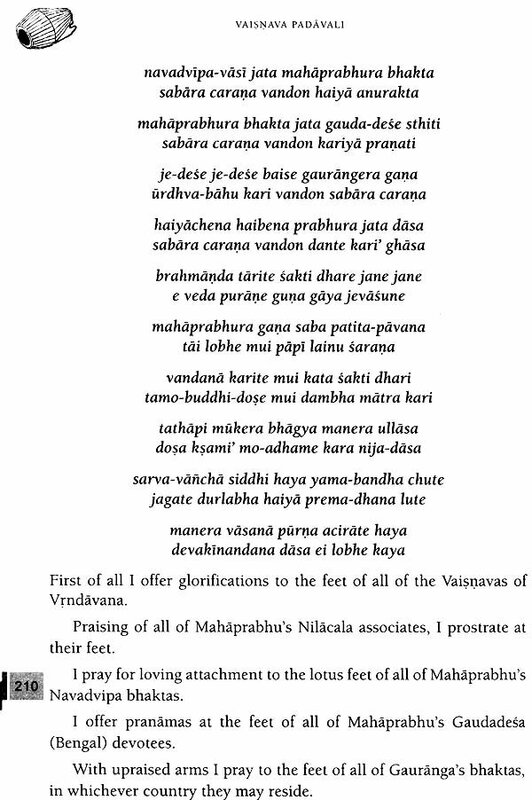 Srila Prabhupada always used to sing the songs of the great Vaisnava acaryas of parampara like Srila Bhaktivinoda Thakura, Srila Narottama Dasa Thakura, Srila Locana Dasa Thakura and he always used to inspire his followers to do the same. 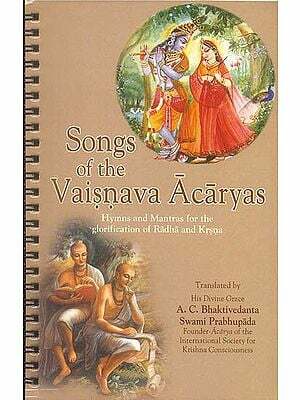 As Srila Prabhupada writes in the foreword to Songs of the Vaisnava Acaryas, "Songs composed by the acaryas are not ordinary songs. When chanted by pure Vaisnavas, who follow the rules and regulations of Vaisnava character, they are actually effective in awakening the Krsna consciousness dormant in every living entity." 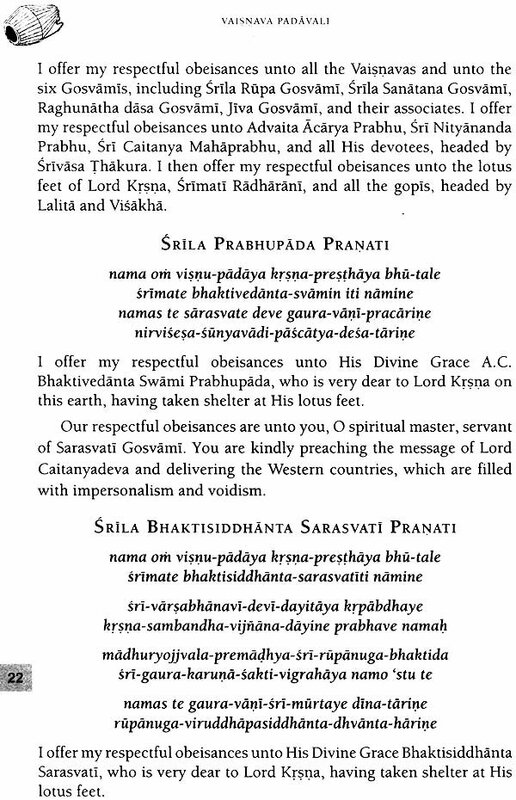 Further he wrote to show the importance of these songs, "I have advised Sriman Acyutananda Svami to sing more songs of the Vaisnava Padavali and record them in books so that my disciples and others in the Western countries may take advantage of this chanting and thus advance in Krsna consciousness more and more." 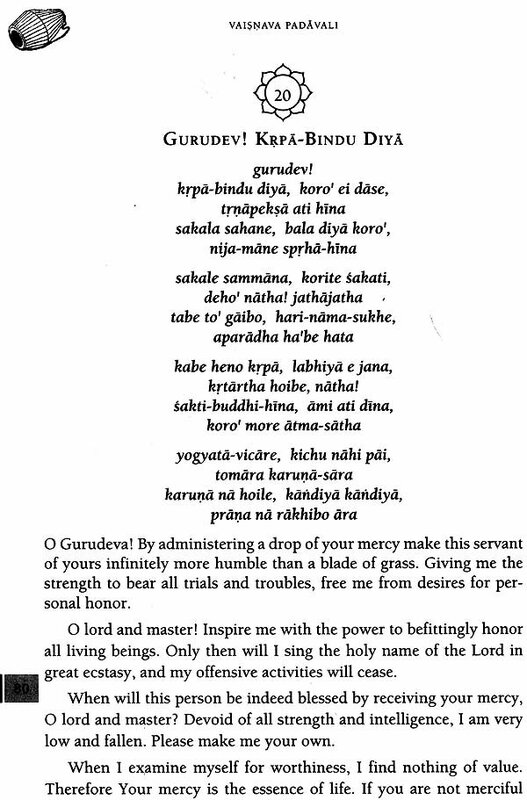 The songs, stotras, and prayers presented in this compilation are authorized by the acaryas of our sampradaya. In these songs, the name, form, pastimes, and qualities of the Lord are described in a pure form which can help sadhaka in getting proper guidance for serious progress in the path of devotional service. By just singing these songs, a person can awaken his dormant Krsna consciousness and relish the nectar of Krsna prema. Great devotees whose lives are totally surrendered to the Lord of Vrindavan, Sri Krsna, composed these songs and bhajans. In the age of Kali most munificent Lord sri Caitanya mahaprabhu appeared along with his personal associates to deliver the fallen conditioned souls from the cluches of birth and death. In this material world, the souls who have turned their backs toward the Lord are always burning in the fire of threefold miseries known as tritapa. Srila narottama Dasa Thakura says in his song. “Day and night my heart burns from the fire of the poison of worldliness, and I have not taken the means to relieve it. To get out of this trouble some situation Lord has given the simple and sublime process, the chanting of the holy name of krsna. 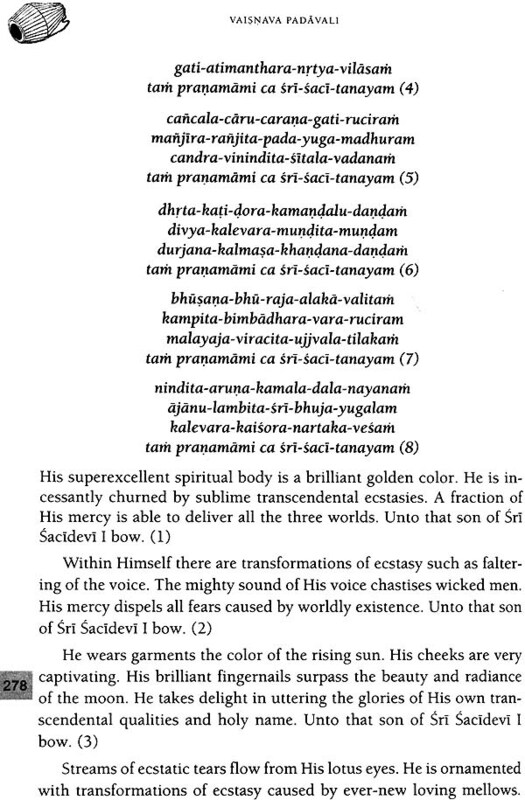 He is known as “Kaliyuga Pavana Avatara”- the deliverer of the age of kali. He distributed the love of godhead to one and all and by sending His eternal associates He continued this task all over the world. So, by the causeless mercy of Sri Caitanya Mahaprabhu we are publishing a matchless collection of Vaishnava songs by the name “Vaisnava Padavali.” These songs are full of devotion and are composed by His eternal associates and devotees. The words disseminated from the lotus mouth of great Vaisnavas and Mahajanas who are surrendered to the lotus feet of Sri Gauranga Mahaprabhu are auspicious for the three worlds. If a living entity takes shelter of the words of great Vaisnavas written in this compilation, he immediately gets delivered from the fire of birth and death and attains real treasure - the love of Godhead. For the benefit of living entities, the great acaryas of Gaudiya vaisnava sampradaya have presented the hidden and deep meaning of the scriptures in the form of songs, which are full of love of god and are composed in a very simple manner. 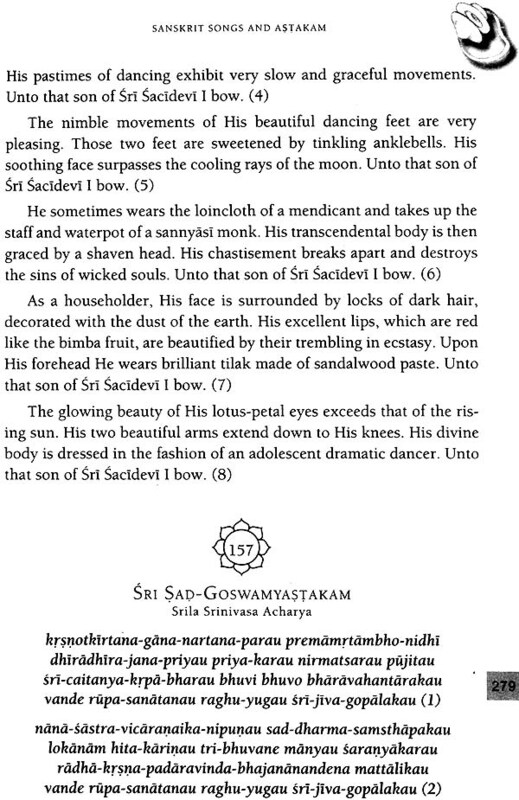 Vedic Scriptures describe ‘Madhavastavapriya’, which means Lord Madhava loves stave or stutis very much. In His form of Jagannath , He leaves His temple Sri Mandir in Puri Dhama to hear Sri Gita Govinda of Srila Jayadeva Gosvami. 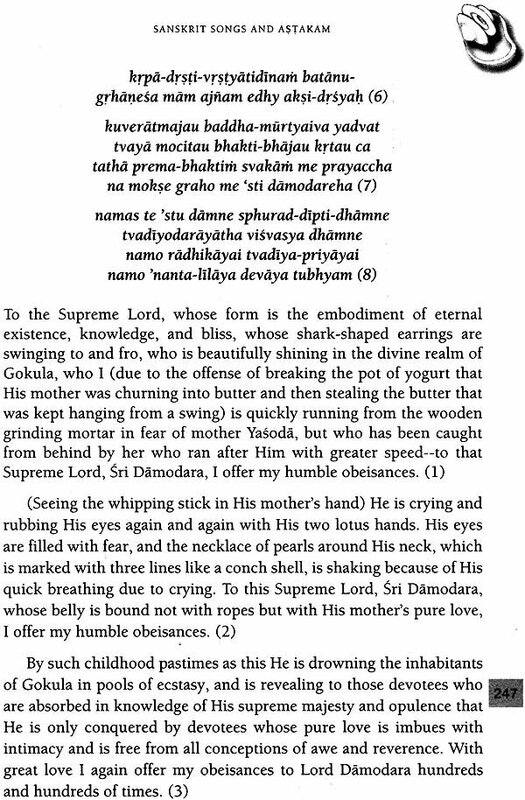 Srila Rupa Gosvami says in His book ‘Bhakti rasamrta sindhu that if one glorifies Lord madhusudan with stavas’, which are composed by the devotees of Lord, then he is freed from all kinds of sins and goes to Visnuloka. In Skanda Purana it is said.” If the tongue of a person is always decorated with the jewels of prayers of Lord then he is always honoured by Munis, siddhas, and demigods. 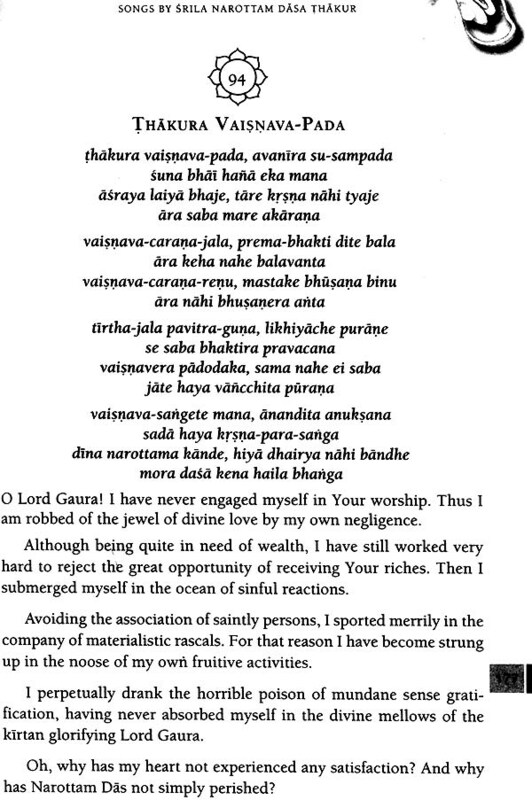 Srila Prabhupada always used to sing the songs of the great Vaisnava acaryas of parampara like srila Bhaktivinoda thakura, Srila Narottama Dasa Thakura, srila Locana Dasa Thakura and He always used to inspire His followers to do the same. As Srila Prabhupada writes in the foreword to songs of the Vaishnava Acarayas, Songs composed by the acaryas are not ordinary songs. When chanted by pure vaisnavas, who follow the rules and regulations of Vaisnava character, they are actually effective in awakening the Krsna consciousness dormant in every living entity. Further he wrote to show the importance of these songs. I have advised Sriman Acyutananda Svami to sing more songs of the Vaisnava Padavali and record them in books so that my disciples and others in the Western countries may take advantage of this chanting and thus advance in Krsna consciousness more and more. 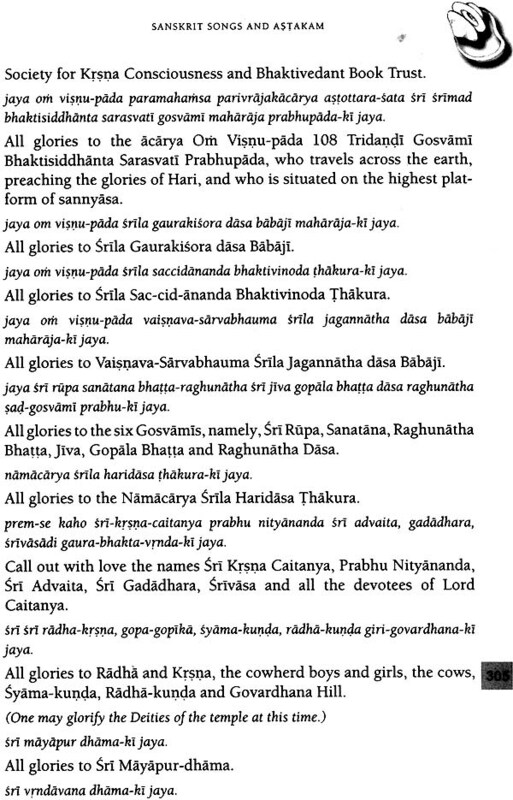 The songs, stotras and prayers presented in this compilation are authorized by the acaryas of our samprdaya. In these songs, the name form pastimes, and qualities of the Lord are described in a pure form which can help Sadhaka in getting proper guidance for serious progress in the path of devotional service. 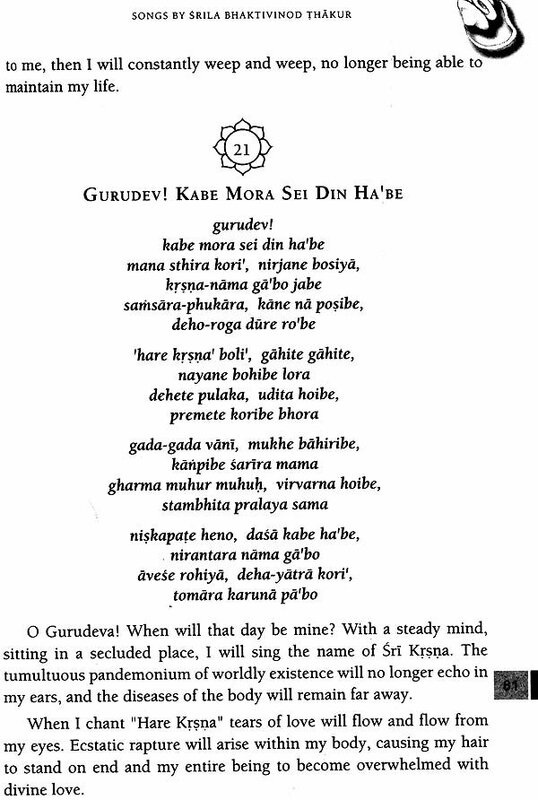 By just singing these songs, a person can awaken his dormant Krsna consciousness and relishthe nectar of Krsna prema. 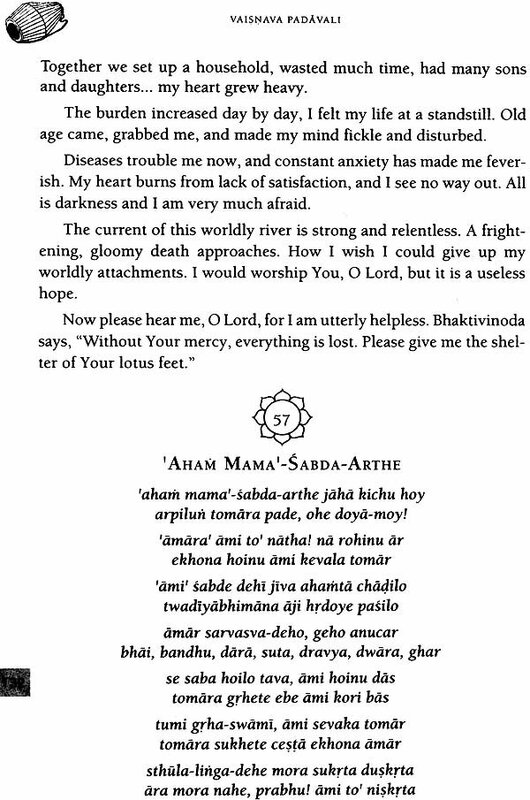 Geat devotees whose lives are totally surrendered to the Lord of Vrindavan, Sri Krsna, composed these songs and bhajanas. The songs of these acaryas have the potency to bestow love of Krsna as these songs are full of sweet language and melody which is very dear to the ears of the Lord and His devotees. I beg to offer my sincere thanks to all the devotees who helped me to successfully publish this book. Within my heart I am indebted to His Grace Vrindavan Vinod Dasa who has designed a beautiful cover for this book and Bhaktin Divya Radhika who spnet lots of her time and took responsibility to draw the sketches, which we used in this book. Also I would like to thank anuttam Hari Dasa for arranging the the design and layout and amal Carana Dasa for helping me to collect the text. May they be blessed with supreme gift loving devotion of Krsna.